When it comes to wooden arrows, nothing says traditional archery like barred feathers, and when it comes to barred feathers, nothing oozes mojo more than those recovered from a wild bird. Don’t get me wrong, factory barred fletching looks great. They’re consistently marked, come in a variety of colors, and do not require the work turkey feathers do before they are ready to fletch. On the other hand, they are easy to spot and can look a bit tacky. I’ve been on a primitive archery vision quest for the past few months, and see myself hunting with primitive tackle within five years time. This means wood selfbows and bamboo arrows with self-nocks and knapped obsidian – all of my own design and construction. This will be difficult, considering I’ve only taken a handful of animals with my semi-modern glass-powered tackle, but worthwhile nonetheless. A friend of mine processed these feathers for me and they were absolutely flawless upon arrival. Ready to chop! I can only hope to be this efficient. My path to the primitive will be wrought with a series of baby steps – some going forward, some going back – and all of them necessary. If I add one primitive element to my tackle a year, I’ll fulfill my goal as planned. I began by hunting with my own wood arrows this season. I started with aluminum, switched to wood, then went back to aluminum, and returned to wood to finish out the year. The ironic part of the fluctuation was that I had two blown opportunities and both of them occurred while hunting with aluminum. I spent all that time worrying that my cedars wouldn’t do the job, and it was the perfectly tuned modern shafting that missed both deer. I swore off aluminum and carbon from that point on. If I’m going to miss it might as well be with an arrow of my own creation, which is the only arrow I’ll be carrying into the woods with me in the future. I’m going to take it one step further by imploring genuine wild turkey or goose feathers. Sure…it isn’t a huge step, but you’ve got to start somewhere. I’ve compiled a few pointers for those of you interested in doing the same. As the majority of you are already aware, there are left wing (LW) and right wing (RW) feathers on the market. Why? Because a turkey has a left wing and a right wing. I didn’t know the two correlated at first (believe it or not) but there is most definitely a difference. Collect and store them in separate freezer bags marked RW and LW to avoid confusion. Be sure to store them in the freezer to avoid drying them out. I collected feathers for a year and ruined them all by leaving them in my basement next to a furnace. 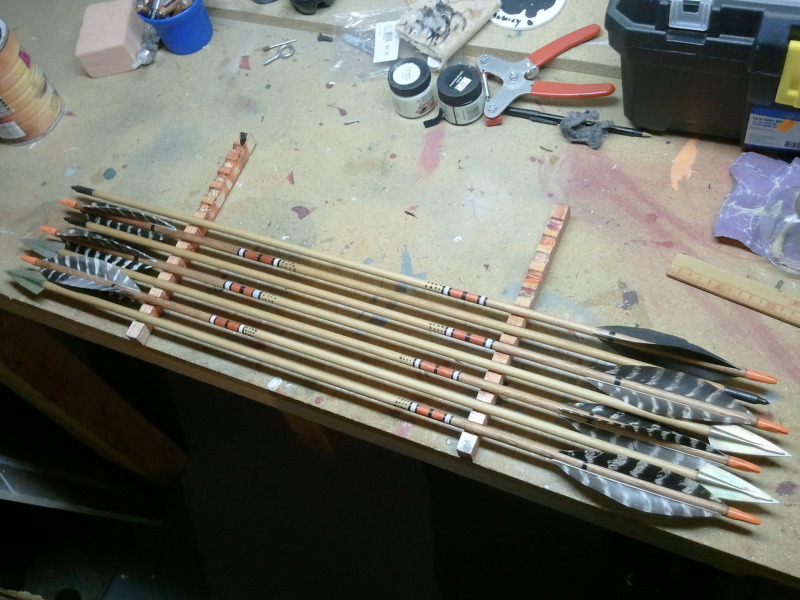 There are a variety of ways to prepare natural feathers for fletching, but Mickey Lotz of Primitive Archer magazine has the simplest and most concise step-by-step I’ve seen. Click here to read that article. Or check out “Cutting Canada goose feathers for fletching” by buzzzz1964 on YouTube for a more in depth look. I used a spare fletching jig clamp, a piece of sandpaper, an exacto knife, and a Lil Chopper feather chopper on my first attempt and it worked fairly well. A word to the wise, splitting the actual feather is the hardest part. Use the sharpest knife possible and be extremely careful! Work slowly and be patient. In fact, you’ll be better off doing a few at a time rather than a whole bunch at once. It can be stinky, frustrating work. You will also need to make absolutely sure that the bases of your feathers are sanded evenly or fletching will be a nightmare. It is best to crest your arrows before fletching. I crested these with white acrylic craft paint, a bit of orange dye, and highlighted with a sharpie. Note that polyurethane doesn’t work well as a final coat once you’ve crested as it tends to eat away the sharpie. I prefer Polycrylic and brush it on very lightly. Proceed as per usual if you are using a fletching jig and Duco cement. Exercise caution when clamping the fletching into your jig. Natural feathers are a bit softer. Goose feathers are particularly flimsy once cut. I highly recommend using Fletch Tite Platinum to dab both ends of the feathers once they are attached to the arrow. Duco cement has a way of flattening out when drying. Fletch Tite does not, and this makes for a smoother transition when gliding over your bow’s rest. Check “Fletching primitive arrows (a better way)” by primitivepathways on YouTube if you would like to fletch the primitive way. I decided to leave these unchopped for a more primitive look. They are actually goose feathers, which I actually prefer and hope to get more.